A selection of intimate artworks by renowned painter Angelo Ippolito marks the second exhibition in BC&E's Beaver Street gallery, located in the alley opposite the Co-op in downtown Belfast. On view will be a selection of oils, watercolors, and collages, many created in response to seaside locales, such as the Adriatic and Aegean. 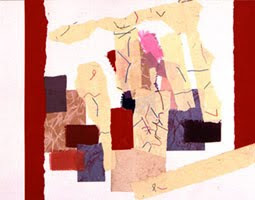 All convey the artist's signature concern for capturing the vibrant air where the sky meets sea or land. The opening reception is Friday August 13th from 5-8 pm; the gallery will also be open Friday evenings throughout the summer, as well as by appointment. Apart from sharing the visions of diverse artists, exhibitions in this windowed corner office offer interested visitors a chance to meet cohousers and learn more about their vision of creative sustainability. "Between Sky and Sea: Intimate works by Angelo Ippolito" celebrates the creativity of BC&E's extended family by showcasing work by the father of member Jon Ippolito. 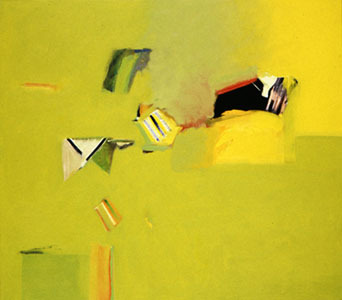 Best known for his prominent role in the New York School of abstract expressionism, Angelo Ippolito (1922-2001) produced a body of paintings and works on paper renowned for their lyrical color, light, and compositional rigor. Having immigrated from Italy at age nine, Ippolito helped usher in the downtown New York arts scene by co-founding the influential Tanager gallery in 1952, whose members included celebrated Maine painters Alex Katz and Lois Dodd. His paintings gained acclaim for their "brilliant color" (Fairfield Porter) and "joyous lyricism" (Dore Ashton). 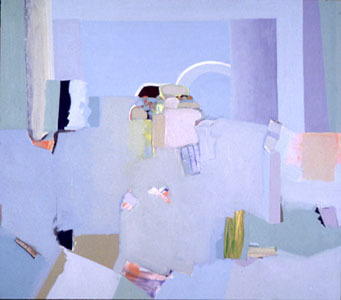 Long featured in the collections of New York's MoMA, Whitney, and Metropolitan museums, Ippolito's work has recently been seen in Maine via acquisitions by Colby College (2010) and the University of Maine (2008), whose president Robert Kennedy described Ippolito as "an accomplished artist of the first order." The exhibition is curated by Jon Ippolito with help from Jeffrey Mabee and Elizabeth Garber, all BC&E members. You can find more information on the artist at AngeloIppolito.com; for more on the show, please email info@mainecohousing.org or call 207-338-9200. What a coup for Belfast to have that extraordinary work on view! Just incredibly beautiful.